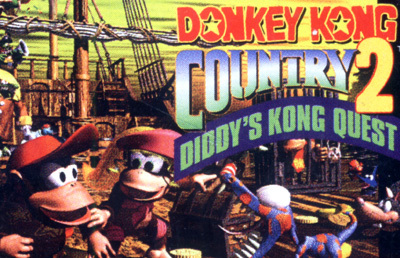 Donkey Kong Country 2 has sold over 4.37 million copies woldwide, making it the sixth best-selling game on the SNES. Donkey Kong Country 2 starts where the first game left off, in an area known as Gangplank Galleon. After this first world, the player reaches K. Rool's island, called Crocodile Isle, where the rest of the game takes place. In order to progress through the game, players must beat stages by reaching the finish without losing both characters. The stages are divided into worlds, each one normally containing a boss fight at the end which must be beaten in order to move onto the next world. In comparison with the original Donkey Kong Country, the game contains many new features. These include a plethora of hidden bonus stages with collectible tokens rewarded for completing, more diversity in level design and level settings, an unlockable "Lost World" with extra levels, and the ability to transform into various animals (the first game included some of these animals, but the characters normally rode them, being able to transform into them only in bonus stages).